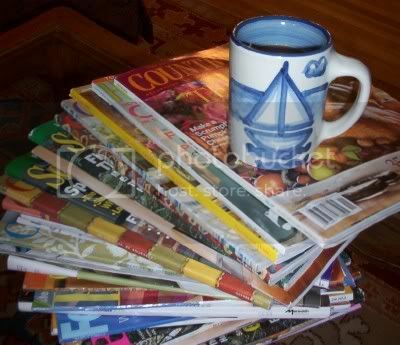 An afternoon of Open Houses, freshly vacuumed floors, a mug of hot cocoa and a nice big stack of recycle-bin decorating magazines...all simple but inexpensive pleasures. Can a Sunday afternoon get any cozier than this? Are you house shopping or just looking for decorating ideas at other peoples' houses? listing in August when life has settled down but missing that spring surge in the market. I have no idea. This is the only house I've ever owned and I thought you usually needed 3 years to make back your investment, but you've done this before. I will say that I have moved while pregnant before and I would rather get all the moving out of the way with the baby still on the inside than afterwards. My kidlets are big on being held or wrecking the place for the first two years and I never get much done. I think that it would be easier to move before the baby. For me, life gets more complicated with each baby, and it seems so much harder to get anything done, or go anywhere with each new little one that comes along....do you have family around that will help you? We don't, so that would be a huge consideration about the whole moving timline. Your three year old will probably need more attention from you after the baby comes, and it might be really stressful to have to devide your time between the new baby, your 3 year old, and a new house too. Plus, it would be nice for you to have your husband around during the summer to help you get settled into the new house, before he gets busy again with school events. Just some thoughts! Looks similar to my Sunday afternoon! My husband built a fire, moved the rocking chair over in front for me, and I sat there and read while my little one napped for over an hour! It was heavenly!